The last few posts published here have been focused on the unfortunate but expected discord that can result from doctrinal disagreement within a family and between believers when Christians do not remain faithful to "the faith that was once for all delivered to the saints" (Jude 1:3) or all the things they say they believe, teach, and confess that is in accord with the Word of God. The "Parable of the Sower" readily comes to mind as a possible explanation for this frustrating spiritual phenomenon. The sword divides and separates and the seed gives renewed hope and life. As Rev. Sam Schuldheisz once preached about this passage, it's a "parable about a reckless sower who scatters his seeds everywhere -- hard-packed turf, rocky soil, weedy dirt, good topsoil -- it doesn’t matter! Jesus treats the proclamation of His merciful, gracious word of forgiveness the same way too: spreading it with abundant, joyous abandon." Yes, Jesus uses the examples of three different soil conditions to explain why hearers failed to understand the Word. Understanding the Word of God is the Father's gift to His children. Parables both reveal and conceal. For the non-believer, parables were a form of God's judgment, because they refused to listen to the clear Gospel message. This parable gives us encouragement that when a laborer faithfully sows the seed, a plentiful harvest may follow, even if some seed goes to waste. We are tempted to give up a task when we experience little success. That is also true of our efforts to share the Gospel. Let us not grow weary in doing good, knowing that at the right time we will reap, because God provides the harvest (Galatians 6:9). However, at the same time, we dare never take our spiritual blessings for granted, for then we put ourselves in danger of losing them. 99] Likewise those fastidious spirits are to be reproved who, when they have heard a sermon or two, find it tedious and dull, thinking that they know all that well enough, and need no more instruction. For just that is the sin which has been hitherto reckoned among mortal sins, and is called ajkhdia, i.e., torpor or satiety, a malignant, dangerous plague with which the devil bewitches and deceives the hearts of many, that he may surprise us and secretly withdraw God's Word from us. 100] For let me tell you this, even though you know it perfectly and be already master in all things, still you are daily in the dominion of the devil, who ceases neither day nor night to steal unawares upon you, to kindle in your heart unbelief and wicked thoughts against the foregoing and all the commandments. Therefore you must always have God's Word in your heart, upon your lips, and in your ears. But where the heart is idle, and the Word does not sound, he breaks in and has done the damage before we are aware. 101] On the other hand, such is the efficacy of the Word, whenever it is seriously contemplated, heard, and used, that it is bound never to be without fruit, but always awakens new understanding, pleasure, and devoutness, and produces a pure heart and pure thoughts. For these words are not inoperative or dead, but creative, living words. 102] And even though no other interest or necessity impel us, yet this ought to urge every one thereunto, because thereby the devil is put to Right and driven away, and, besides, this commandment is fulfilled, and [this exercise in the Word] is more pleasing to God than any work of hypocrisy, however brilliant. I can't just stop there though, because the "Parable of the Weeds" immediately follows this one and it definitely speaks to me in my current situation for sure! Matthew 13:24-30, 36-43 "The Problem of Weeds"
But of course, Farmer Jesus has the whole field in view here. And though his farming methods may seem strange and backwards to us his gracious rule and reign, the kingdom of God in human flesh, works among us precisely by such strange and backwards methods: his incarnation, his humble life, his more humble death. So, before we get too far ahead of ourselves, stop and think: what’s this parable all about? And don’t say: “Duh, pastor, Jesus gives us the explanation. Just read that.” True enough. But what’s Jesus teaching and declaring to us? How would you summarize this parable for someone else? What’s the parable primarily about: judgment or joy? God’s justice or mercy? Now, before you jump up and raise your hands, be careful. Think about your answer to that last one. And while you’re thinking about that question, let’s hear the parable again. "The kingdom of heaven may be compared to a man who sowed good seed in his field, but while his men were sleeping, his enemy came and sowed weeds among the wheat and went away. So when the plants came up and bore grain, then the weeds appeared also." 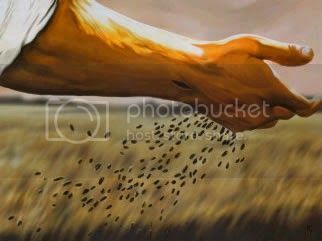 Now, the sower of the good seed is the Son of Man, Jesus. The field is the world or literally the cosmos. The good seed is the sons of the kingdom – God’s children, heirs of Christ, who like Paul says in Romans 8 are adopted by grace and receive the Holy Spirit. The weeds are the sons of the evil one. And the enemy who sowed the weeds is the devil: he who was thrown down out of heaven and he who throws accusations and sin in our face. The devil sows corruption, confusion, and chaos. Reminds me of Alfred’s words to Bruce Wayne when talking about the Joker: “Some men just want to watch the world burn.” That’s why we join Paul and all creation in groaning with expectation for the revealing of the sons of God. Sorry that was so long making this post even longer, but I wanted to include the entire sermon for impact, especially for those like me who needed to be reminded of those truths. In a Lutheran layman's terms, we should continue to pray that the Lord would keep us from becoming discouraged as we entrust our lives to His Word, experience divisions within our families due to our faithfulness, and seek to share His message of salvation with others who are sinners just like us.